100% HANDWOUND This (like my pickups) was a carefully studied, and concerted effort to stay true to original vibe, all while re-creating the necessary Vintage bite, warmth, and feel that good wahs have. I purchased several different wahs, from many manufactures and years of production (vintage, new, retro) and was dissatisfied with the way they sounded. Ranging from either needing a complete overhaul, to not having enough throat, or just being way too thin, and nasally sounding, I never seemed to find exactly what I wanted. In all honesty, it became an obsession. My learning started in modifying whatever circuit I could get my hands on. Eventually those notes, and ideas were transferred to a bread board, then a home PCB board. Eventually I learned, and paid my dues in PCB prototyping land, and after what seemed like years of refinement (trial and error) I resurfaced – and the McWah was born. This is how the McWah came to be. A broke (imagine that) U.S. Enlisted Marine, and aspiring musician who was looking for authentic, vintage sounds all the while trying to find a way to find/obtain playable, good sounding gear. I wanted to be able to achieve this without having to buy an original $800.00 + Vintage (early model) late 60s Wah-Wah from eBay – something that would need more service to make gigable, costing me even more beer money that I was always lacking. 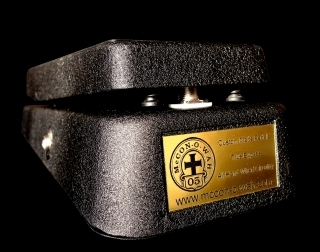 • 1% tolerance resistors are used for better consistency in sound wah, to wah. • High quality, Low-Noise capacitors are used for better filtering, and freq. response. • Wax Sealed, Hand Stamped, and Hand-Wound (by me) 500mH Small-Hole Halo Inductor; nearly identical to an in inductor that you would find in a Vintage 1967 Clyde McCoy that various Celebrities used on monumental recordings. • Hand selected transistors for maximum chewiness, and range of expression through out the operating band. • Through hole soldered, solder masked, and protective coated board (designed by me, not a foreign entity) which allows for a proper solder connection, and greatly reduces the chance of future solder cracks; lead fee solder cracks fairly easy, and the woes of gigging can be hard on gear.